I finished my Teapot Mini. It's a gift for a family friend. She collects teapots so I thought she would really enjoy this. Love it, it's got so much detail. I watched your video on how to do utee and my ladybug got all curled up once it dried. what did I do wrong. I'm frustrated now and don't know if I want to try it again. Very very pretty!!! You are awesome!! I tried the scallop flowers and it was SO easy and I LOVE the way they came out. Thanks so much. That album is absolutely awesome! I love all of the intricate details. I'm sure that your friend will fall in love with it. Very cute. Love the butterflies. Show us how to do it. Also the Martha Stewart punch, very pretty. You are so very creative. I love visting your site, you always have something great. Who wouldn't want to receive that as a gift. I turned out great! Cute, I got this chipboard album at Michaels too! I paid one dollar..lol. My mother loves to drink tea so I got it to make her a mini album. Now I have some wonderful ideas on how to make it. Thanks for sharing! Hey Christina, love your album. Can you tell me what the 'thing' is called that you used on the butterflys and the MS punch. Is it like the SU crystal effects? Also, the envelope on the final page - is that a sizzix die? Thanks heaps. 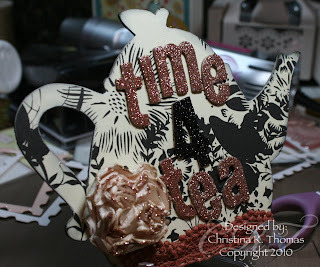 I used UTEE (Ultra Think Embossing Enamel). It's a clear embossing powder, but thicker. The more layers you add the thicker and more glassy it looks. I've never used Crystal Effects, but I think it's the same. You can get UTEE at Michael's and Acmoore and it does come in other colors. The envelope is the Scallop edge sizzix die from Stampin' Up!. Way cute. Oh my goodness! That mini album is adorable, I love it! Is there anyway for you to do a demo on the cupcake chipboard album. I have no clue what to do with mine. LOVE, LOVE, LOVE this album, Christina!!! What a beautiful project you created!! And so perfect for someone who collects teapots!!! You amaze me with the embellishments you come up with!! So creative!!! Thanks SO very much for sharing this awesome creation with us!!! B E A U T I F U L!!!!!! You are amazingly talented, I LOVE your mini album!!!! you did such a wonderful job, I MIght try making one some day:) Have a great day Christina! Can't wait to make this and send to my friend Rhonda in CA. who collects teapots!! This is a sure hit. Christina, could you show us how to add paper to the chipboard. I've seen these alot, but don't know how to get started. I'd appreciate it!!! Amazing and so beautiful!! I just love it. I would love to make one myself. Thanks so much. The detail is so wonderful on your little teapot album. We should all be so luck to be one of your good friends. I known your friend is just going to be blown away. This is incredible! Thank you for sharing all your ideas! This may be silly, but how do you get the paper the same shape as the teapot to cover the chipboard? Love your mini album. You put a ton of details into it. I am sure your friend will love it. The paper is gorgeous. That is a very cute mini, I have the same punch and I love it. Gloria C.
Wow Christina!!! Do you give lessons? lol, you are so creative! Your album is exquisite! Does your mom sell her flowers? This is so cute! I might have to attempt this! What a great gift idea! Wow Wow Wow! Nice job, so much time must have gone into making that book. Great work. Oh Man ANOTHER fantastic video. I asked my friend to pick me up a Tea Pot today at M's I am so excited. I know I come on here and ty ty and ty some more but I need to let you know I did my 1st Tinkerbell and it was because I watched you over and over and decided to give it another try. It dosen't look 1/2 bad. Thanks Christine for your detailed videos. Love your Tea Por Mini. I don't crapbook so it's so hard for me to do these mini's, but I love them. I need a local workshop to learn how to do them. This is beautiful. What a great gift for your friend. Thanks so much for sharing. That teapot mini album could not be any cuter!!! Thank you so much for sharing this idea. I will be using it a lot.I found your blog by accident. I am so glad I did. Sometimes accidents are the best things in life. WOW! This is so beautiful! It's stunning really! I just love every detail on every page! What is the Uti you keep talking about? I haven't heard of it? Seems really neat, like a stiffening product or something? Amazing job and thanks so much for sharing!